Whoop, whoop, another free cookbook for me from Abrams for participating in the Abrams Dinner Party. Don't get too excited. There's no food, but I do get cookbooks sent to me to review. 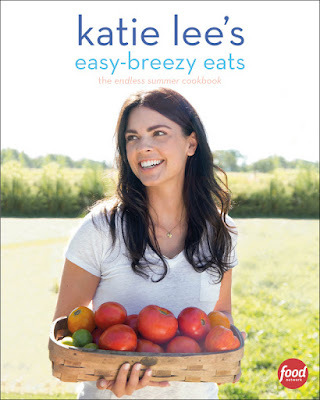 This time, we're looking at Katie Lee's Easy-Breezy Eats by (please tell me you guessed it) Katie Lee. This is the kind of book where you look at the cover and immediately assume a few things. First, the tagline the endless summer cookbook and the basket of produce leads you to believe there will be a lot of fresh ingredients and not too many cans of soup. Second, Katie looks relaxed and happy and she's standing in a field holding that basket of produce. So, I'd assume that the recipes are somewhat easy, fresh, and relatively healthy. Turns out that the assumptions are pretty much correct. One of the first recipes I bookmarked was a grilled zucchini, corn, black bean, and avocado salad. Sounds simple enough, and the ingredients are basic. Like, you'd have no problem finding them in just about any grocery store if you didn't happen to already have them. To make the recipe easy, the black beans come from a can, but then we have fresh zucchini, avocado, and scallions. I could eat this as a side dish, as a salad, or a lunch. Next on my hit list was fish tacos, where the recommended fish is any flaky white fish. That's simple. A recipe for chipotle sauce is included, as well as garnished. This is the kind of recipe where you could prep the sauce and garnishes the night before and cook the fish right before serving and dinner would be on the table in just a few minutes. Another one that caught my eye was corn fritters. I'll be making them for sure when corn is local and plentiful and I've (as usual) bought more than I needed. The recipe is simple, but you can dress them up any way you like. Some of the recipes do sound just a little fancy or complicated, like the Kiwi Blueberry Pavlova, but when you read the recipe, it's actually not that hard. But it would look awfully pretty as a summer dessert when you have company. This is the kind of book that I might use for inspiration as much as for the recipes. Cornbread Panzanella, for example, is something that I probably never would have thought of. And it's genius. But if I made it, I probably wouldn't fuss with using exactly the colors of bell peppers she suggests. Yeah, I'm a radical like that. If you didn't notice the blurb at the top, I'm telling you, again, that I got this book for free. Yup, it's good to be me today.